Dr. Howard Gardner was born in Scranton, PA in 1943. His parents were refugees from Nazi Germany. As a child he was an avid reader and loved music, he later became a gifted pianist. As a young man he enrolled at Harvard University and found it an exhilarating place for learning. He started out as a History major but was eventually led to cognitive developmental psychology. In 1983 he developed the theory of multiple intelligences for which is widely known. He has been involved in school reform since the 1980s. In 1986 he began to teach at Harvard Graduate School of Education and began his role at Project Zero, a research group that focuses in human cognition with a special focus on the arts. Dr. Gardner is married to Ellen Winner, a developmental psychologist, and has four sons and one grandchild. His passions are his family and his work. He enjoys to travel and the arts. For more, visit Howard Gardner’s Personal Site and read his books. Learn more about Multiple Intelligences or read another biography by clicking below. Isabel Briggs Myers & Katharine Cook Briggs – Personality type researchers. 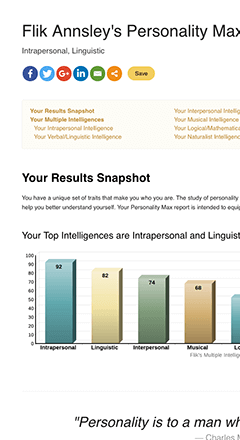 Personality Max’s Multiple Intelligences Test has no connection to and is not in any way endorsed by Howard Gardner.